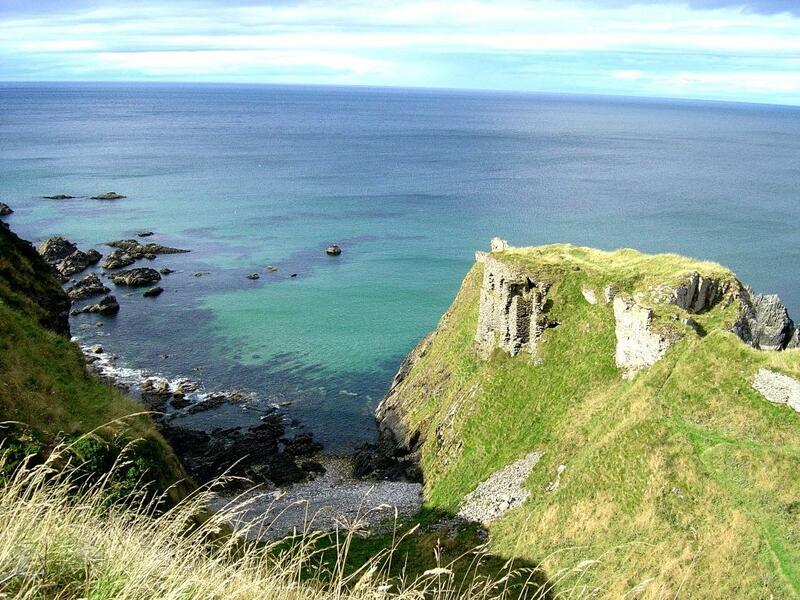 Findlater Castle is built on a clifftop promontory between Cullen and Portsoy on the Moray Firth. It is possible in fine calm weather for the steady-footed to visit with EXTREME caution, as the paths and site are dangerous and unprotected. The castle ruins consist of a hall block on the edge of the cliff, and other wall footings around the edge of the promontory which are difficult to interpret and make the ground levels treacherous. The site was probably fortified in the early medieval period, but any remains have been destroyed by the later castles built on the site, the first of which certainly dates to the 13th century and was repaired in preparation for the invasion of King Haakon of Norway in 1263. Findlater next appears as a name, Geoffrey de Findlater, who was hereditary sheriff of Banff in 1342. When he died was succeeded by an heiress, who married Richard Sinclair, a younger son of the lord of Roslin, in 1366. It is likely that the earliest parts of Findlater to survive today date from the Sinclair years, and that the castle consisted of a courtyard with a well-defended promontory somewhat reminiscent of Roslin itself. In 1411 John Sinclair died, and was himself succeeded by an heiress, married to Walter Ogilvy. The Ogilvies extended and enhanced the castle during the 15th and 16th centuries, but the basic plan of a courtyard with a heavily defended approach along a narrow path remained. In 1600, the Ogilvies had increased their status and influence, and elected to build a more modern and convenient residence at Cullen; one more in line with their position as the most important family in Banffshire. The old castle was left to decay, and as early as 1638 had no roof. By 1786 it was uninhabitable, part of the cliffs having fallen into the sea and taken walls with it.